It was a hair here and a hair there as the first thing noticeable on a hot summer afternoon in Hyderabad was the age range of the crowd. We had everyone from an 11 year old blogger to others who claimed to have grey hairs of wisdom. Over the past few months we have interacted with over 500 bloggers through blogger meets and online contests. We get tons of your support messages and the kind words in some of them are a boost to us every time. 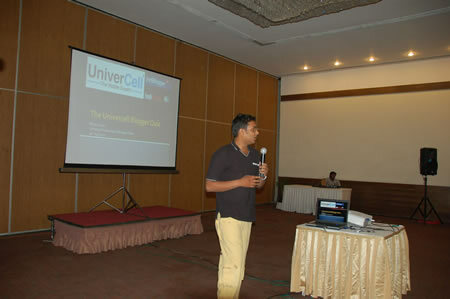 Keep your thoughts coming and thank you for the reviews on the UniverCell IndiBlogger Meet. The chart activity was a great time to connect with friends! I put my comments on a few bloggers. Some bloggers want more time on it. We are still deliberating logistics, but we agree. BTW what is everyone doing with the chart papers? You guys can put them up too, we’d love to see! The Quiz by Riyaz Usman was a good little thing for those who had… BRAINS!!! 🙂 After every question, I would turn around to Renie and ask “What was the question? ?” Aiyo! Very embarrassing!! There were many bloggers who knew the answers and 10 of them won discount coupons from UniverCell, for the rest of us, let’s form a club. 🙂 The names of the winners are in this sacred document. As she did with all your sketch pens, Rashmi put this paper in her pocket and sat down somewhere. Kindly excuse the folds. The document was then torn to protect private data. We also noticed that there was more enthusiasm for the UniverCell blogger contest and we wish you guys the best. This is a great opportunity for bloggers to live the blogging dream, if there ever was one! Anisha @ RCB is doing a great job for the Royal Challengers Bangalore and her work is featured on the RCB website. I am pretty sure that she has tons of fun! The UniverCell contest on the other hand is for gadget bloggers. Staying close to every mobile phone that comes into the Indian market, drool drool! Many thanks to the IndiBlogger.in core guys and Karthik in particular who got things done in time to make possible this very enjoyable meet. We all felt a little bit different at the end of this blogger meet and a tweet from Sanz4U said it all “Don’t forget Hyderabad”. We certainly won’t! We hope you guys liked the video prepared just for Hyderabad. We will be uploading it soon after we add a few elements from the meet. Next story Pepsi Youngistaan ka WOW!